Heather and Ben flew out from Minnesota to Colorado for their Estes Park Winter Engagement Session. We planned this session weeks before the shoot in another location, but as the time came close we switched locations last minute due to extreme winter weather rolling in. 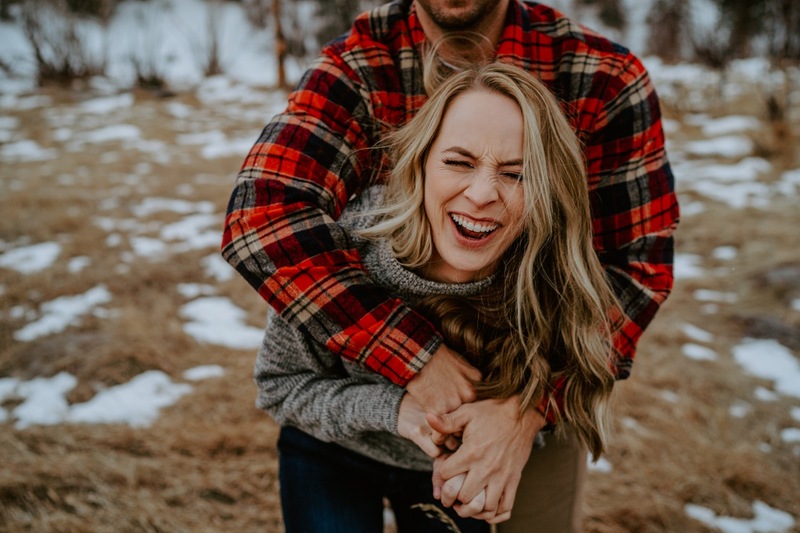 Our original location for their engagement session was high in the Colorado Rockies, but the day before the session, we checked the weather and noticed that the weather would be too severe to go to. A major snow storm with howling winds put a stop on the original location. As a backup engagement session location, we chose the beautiful mountain town of Estes Park. Estes Park had a winter forecast of 4-8″ of snow arriving for the evening, and even though we could see the storm coming in over the mountains, we only received a few snow flakes. The three of us explored different sections of Estes Park, staying warm in between locations as the temperature dropped throughout the evening. I had a blast running around Estes Park with these two capturing the love they have for each other. I know their Minnesota wedding will be just as beautiful as this session. Congratulations to you both, Heather & Ben!